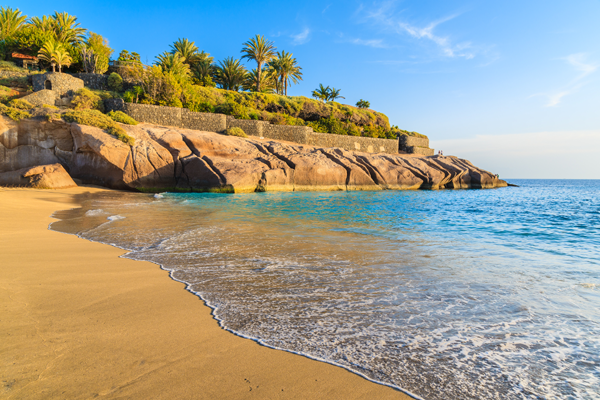 Tenerife has always been a popular holiday destination with British travellers. It is a great choice for a holiday at any time of year thanks to the hot summers and mild winters and a fantastic sunshine record. For many years the most popular resort has been Playa de las Americas, however in more recent times the development has moved further along the coastline all the way up to La Caleta and Playa Paraiso. These resorts along with a number of others on the south west coastline make up the Costa Adeje region. The are many nice beaches in this part of the island such as the Blue Flag Awarded El Duque which offers lovely sand with gentle shelving waters making it popular with families. The beach at Playa Paraiso is a man-made with lovely golden sands. The dark sand beach at Fanabe offers a good choice of watersports and the Torviscas beach is another popular beach for families, whilst the marina at Porto Colon shelters the beach there. Watersports are widely available and include dive centres, banana boats, water skiing, parasailing and of course pedaloes that offer fun for all the family. There is a wide choice of beach bars, cafes and restaurants that are on offer in the Costa Adeje area. Many sit off the promenade or just in the streets of the resorts and there is something on offer for all tastes and budgets. The apartments and hotels in Costa Adeje range from budget to ultra luxurious resort style hotels and again offer something for all budgets. Excursions from this area include boat trips that offer the chance to experience whales and dolphins in their natural environment as well as family boat trips and deep sea fishing. The national park at Mount Teide is at the heart of the island and is easily accessed by good road links from the Costa Adeje area. For the keen golfer there are two courses on offer in the area and a wide choice of other sporting activities too. Two waterparks are close by and offer fun for all ages. There is plenty of shops in the Fanabe and Torvisicas area selling everything from apples to sombreros. The major resort of Playa de las Americas is not far away and is home to the best nightlife on the island, as well as a wide choice of shops and restaurants too. The more laid back Los Cristianos is just a little further down the road and has a lovely relaxing traffic free square which is popular with tourists looking for a relaxing evening with good food. Jump on the local bus or hire a car and explore this wonderful island, make a holiday in Costa Adeje a good place to base yourself, or just lie back and enjoy the lovely year round climate. Call us today and speak to one of our friendly team who will search for a great deal for Costa Adeje.